The backlash against Blumenthal and his closest allies – notably Ali Abunimah and some of his Electronic Intifada writers – was quick and furious. 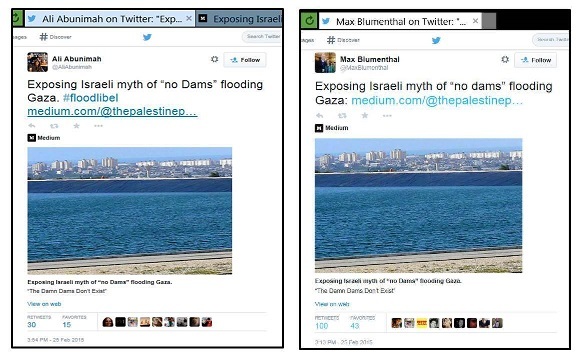 Admittedly, it was a rather enjoyable spectacle, because a lot of the harsh criticism now voiced by disappointed fans (who want to see Israel gone as much as the likes of Blumenthal) could have been quoted from posts I and other critics of his screeds have written: suddenly people were ready to denounce “Max’s fact-free delusions” and his “smear pieces;” my personal favorite was perhaps when Blumenthal’s gonzo journalism was mocked in a tweet ridiculing how he usually concocts the “evidence” to indict his targets: “This NGO took money from a fund whose director once ate lunch in the same restaurant as an employee of an Islamophobe.” (Another delightful parody of Blumenthal’s “journalism” is here). 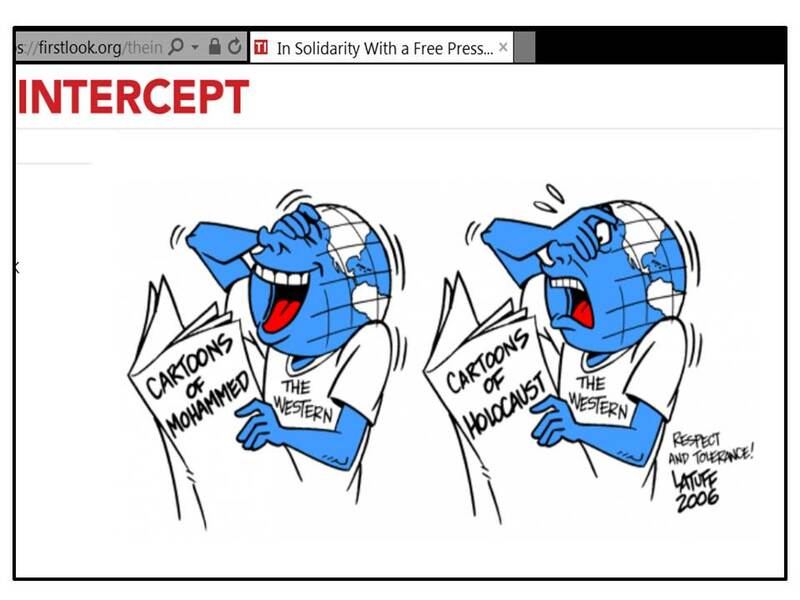 Incidentally, this is also an excellent description of the modus operandi regularly followed by Ali Abunimah and his Electronic Intifada crew. 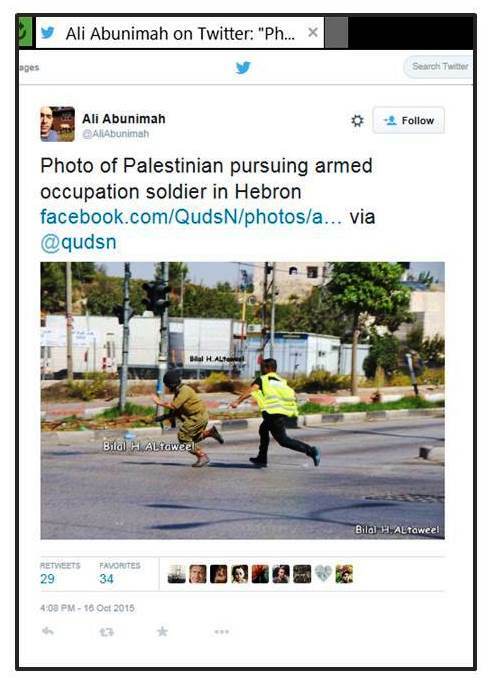 There was indeed quite a bit of “hostility” on social media, some of it helpfully documented by Ali Abunimah himself. One telling example is archived here: Abunimah complained that the “Syrian American Medical Assoc. launches incitement campaign against me/others, claims we’re paid by Assad/Russia.” And apparently, Abunimah didn’t like getting a taste of his own medicine: “This level of incitement – comparing us to Hitler – is getting to dangerous levels.” Abunimah also took offense when his dear friend Max Blumenthal got the Max Blumenthal treatment from erstwhile fans. 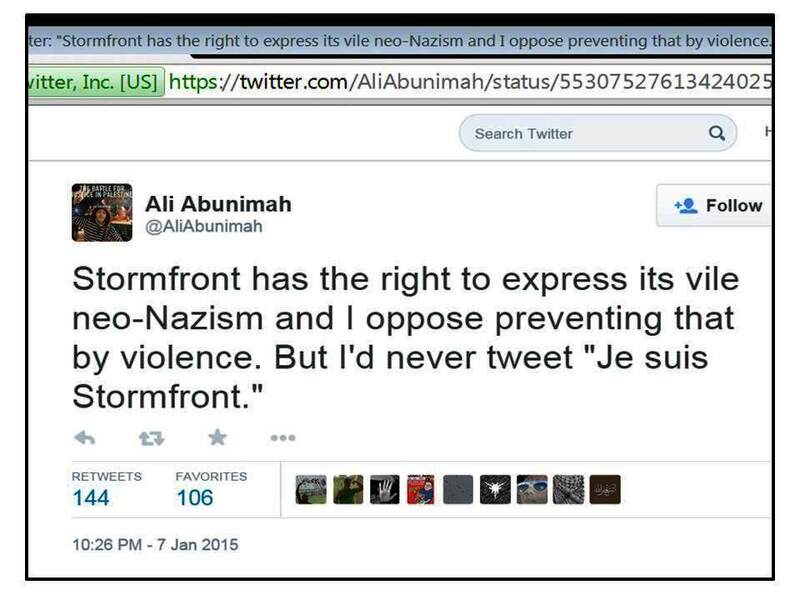 Clearly, Abunimah feels that Nazi smears should only be reserved for Israel. The controversy also revealed a few interesting tidbits showing “pro-Palestinian” stars like Max Blumenthal and Rania Khalek in a rather unflattering light. If Blumenthal really “went to Gaza &burst into tears at a Hamas checkpoint,” the boundless admiration he has expressed for Hamas perhaps also reflects some rather unhealthy psychological dispositions: the more brutal the bully, the more admiration Blumenthal will feel – which may well help to explain why Blumenthal has so much contempt for Israel and the US, and so much respect for Hamas, Assad, Russia and Iran. Last but not least, the disappointment expressed by erstwhile Blumenthal fans offered many more revealing glimpses at how truly pathetic many supporters of the “Palestinian cause” are. One heartbroken Blumenthal fan lamented: “I regret writing a review of @MaxBlumenthal’s Gaza book for @MuftahOrg http://muftah.org/a-review-of-max-blumenthals-the-51-day-war-ruin-and-resistance-in-gaza/ … I see that he’s fallen as low as Rania Khalek.” Check out the linked review posted on July 29, 2015, and you’ll find the highest praise for the “fearless integrity that fuels Blumenthal’s reporting.” You’ll also find that this review is illustrated with an image of the aftermath of a deadly “explosion … at a public garden near Shifa hospital in Gaza City on July 28, 2014.” It’s hard to think of a better illustration for a review praising Blumenthal, because Israel had immediately said that the carnage was caused by Hamas rockets, and even Amnesty International ultimately conceded in the spring of 2015 that “the projectile was a Palestinian rocket.” Ignoring this fact is really a good example of Blumenthal-style “integrity”. But I suppose there’s really nothing more “pro-Palestinian” than to quickly forget how Hamas threw opponents from high-rises in Gaza, tortured them and dragged their bodies through the streets, or executed them ISIS-style on public squares – a spectacle that was actually defended by Ali Abunimah. 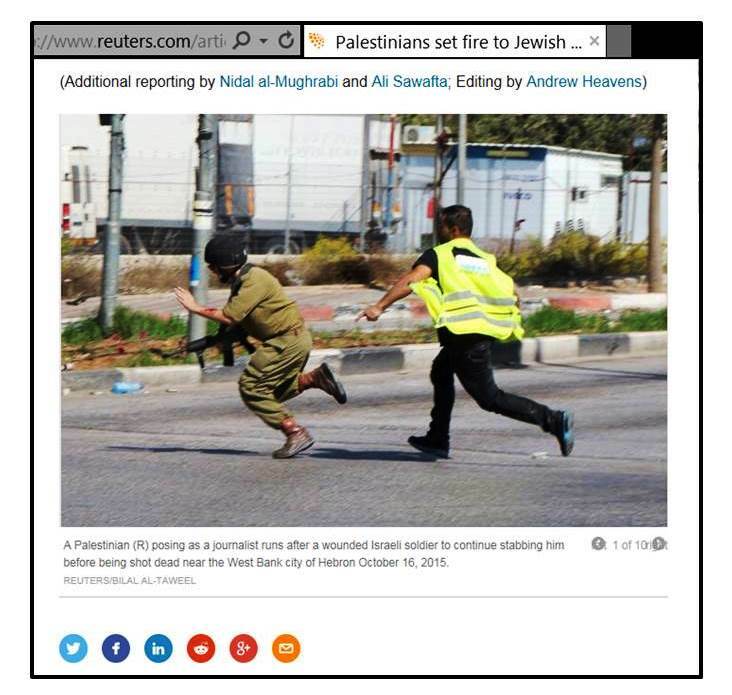 Maybe Max Blumenthal recalled atrocities like these when he burst into tears at a Hamas checkpoint: it must be really scary to be at the mercy of people who treat their own like this – even if you’re a “journalist” who came to glorify those brutal bullies. This is an updated version of a post first published at Elder of Ziyon. 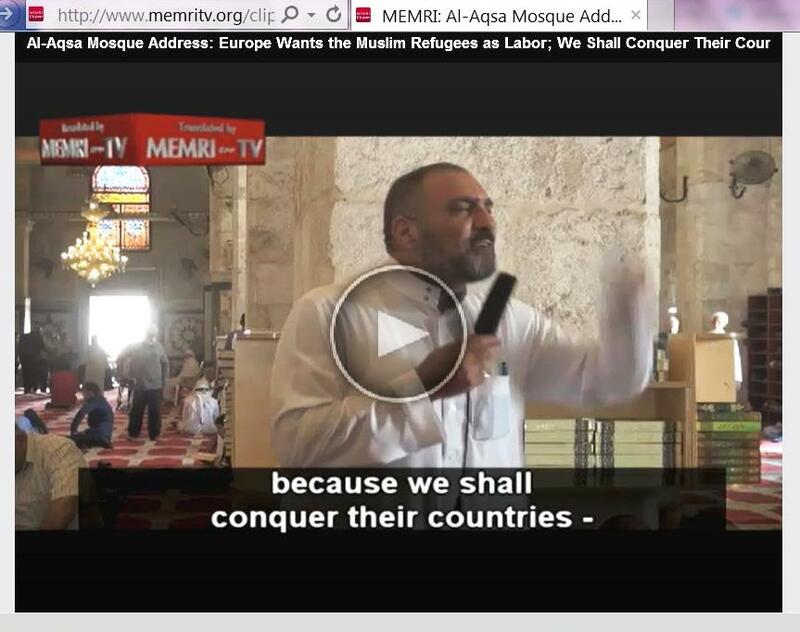 Any European who would oppose Muslim immigration by arguing that the current waves of desperate people hoping to find safety and prosperity north of the Alps will pave the way for a hostile attempt to conquer Europe for Islam would certainly be denounced as an “Islamophobe.” But what do you call it when a preacher at the Al-Aqsa mosque – which is usually described as Islam’s “third-holiest” place – passionately announces that “soon, we will trample them [Europe’s Christians and Jews] underfoot, Allah willing”? If this sounds “Islamophobic,” the politically correct thing is of course to simply ignore this story – and this is just what most of the mainstream media seem to have done. It almost goes without saying that this is not the first time that politically inconvenient stories from the Muslim world have been ignored. Frequently these are stories that would show deeply ingrained Muslim Jew-hatred; however, the arguably very belated revelations in a recent New York Times report about the shocking “tolerance” adopted by the US military regarding the widespread sexual abuse of children by its Afghan allies also provide a more general indication of how eagerly western institutions apply double standards that downplay or ignore profound evils in Muslim societies. 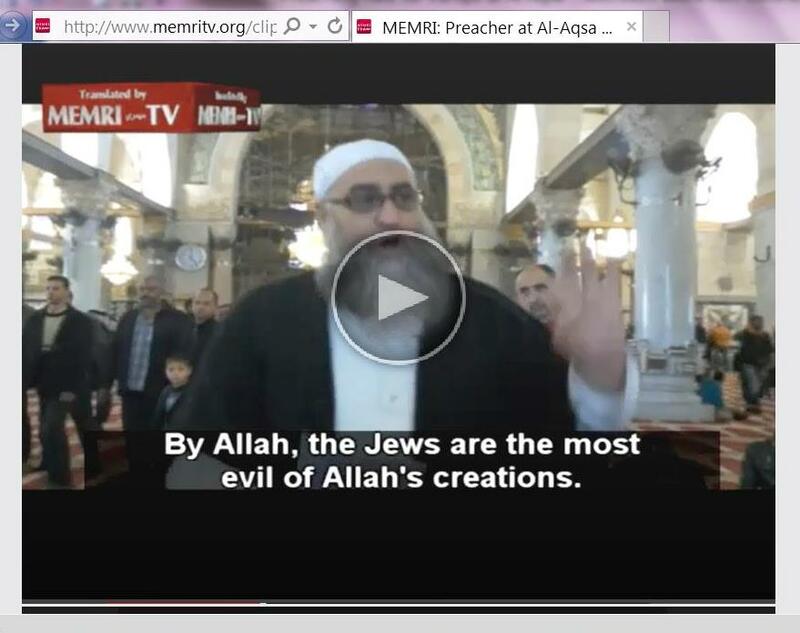 Personally, I would agree that the above cited remarks by the Al-Aqsa preacher are not necessarily newsworthy. After all, one can find fanatics who come up with deranged rants in every creed. But since Muslims claim the Al-Aqsa mosque as Islam’s “third holiest” site, one should assume that the Islamic Waqf – which was left in charge of the whole Temple Mount after Israel’s victory in the Six Day War 1967 – would ensure that crackpots don’t get a platform in this supposedly so important mosque. Unfortunately, however, the hate-filled rant envisioning a Muslim conquest of Europe was by no means a unique incident. 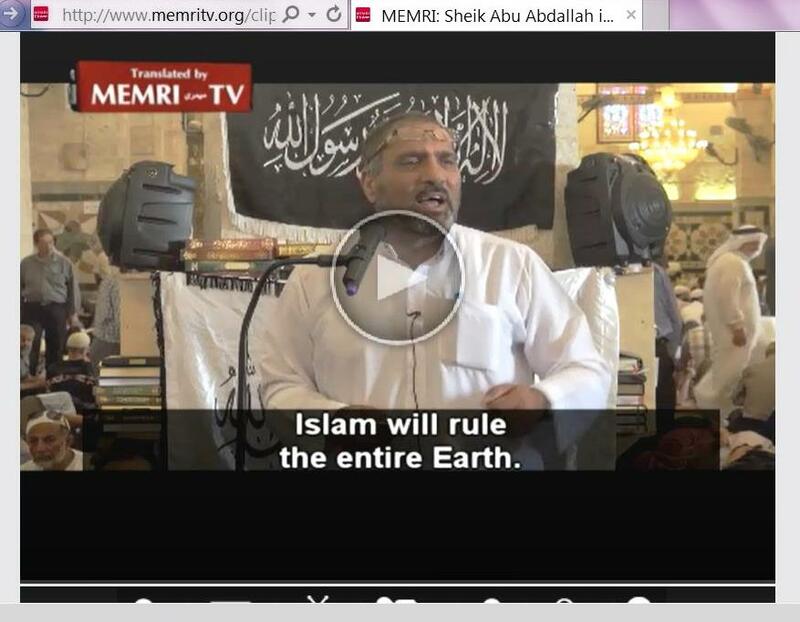 Over the past year, MEMRI has documented several similar “sermons,” and one can only speculate how many go undocumented and what is preached in local mosques all over the Muslim world. Similar remarks were made by two other persons speaking at the mosque in early July. These “sermons” seem to indicate – and encourage – support for the savagery of the Islamic State terror group. In addition, there are plenty of examples showing incitement of Jew-hatred in the vilest and most primitive terms imaginable. The video clips show that most of these rants are not formal sermons with worshipers listening attentively. It seems more like a Muslim version of Speakers’ Corner, where anyone – any man, that is – who feels like delivering a hate-filled rant against the Jews and the West can do so at Islam’s “third holiest” site. Men and young boys mull around, some stop to listen; but in general, the reaction of the audience shows that no one regards it as unusual to come to a supposedly very sacred place of worship and hear non-Muslims demonized and Islam exalted as destined for the bloody subjugation of the non-Muslim world. So it seems that Muslims are quite flexible when it comes to perceived violations of the sanctity of Al-Aqsa. As the recent violence has shown once again, the mere idea that non-Muslims might dare to even just think about a prayer while visiting the Temple Mount easily enrages Muslims, whereas they apparently don’t mind at all when self-styled “defenders” of Islam use the Al-Aqsa mosque to stockpile rocks, debris and incendiary devices to attack police and visitors. Likewise, nobody seems to have a problem with fanatics bellowing out hate-filled rants at Al-Aqsa on a fairly regular basis. As documented above, the reality ignored by the UNSC is that Muslim worshipers at the Haram al-Sharif are absolutely free to indulge in violence, threats and provocation. This is quite plainly what psychologists call projection: since the days of the Palestinian leader who later became notorious as “Hitler’s mufti” – who is still considered a Palestinian hero – Arab and Muslim leaders, as well as activists like Ali Abunimah, have fabricated Jewish or “Zionist” threats to “Al-Aqsa” (increasingly understood not only as the mosque, but the entire Temple Mount compound) to incite often lethal violence. In the same letter, the OIC insists without the slightest sign of embarrassment that Jews and Christians should be denied freedom of worship on the Temple Mount. This shameless hypocrisy is perhaps inevitable as long as freedom of worship for Muslims at Al-Aqsa includes the freedom to indulge in vile fantasies of Islam’s coming conquest of the non-Muslim world. While Abunimah’s last point is correct, both his blog post and a tweet that was popular among Israel-haters were wrong in asserting that only North Korea was seen more unfavorable than Israel. 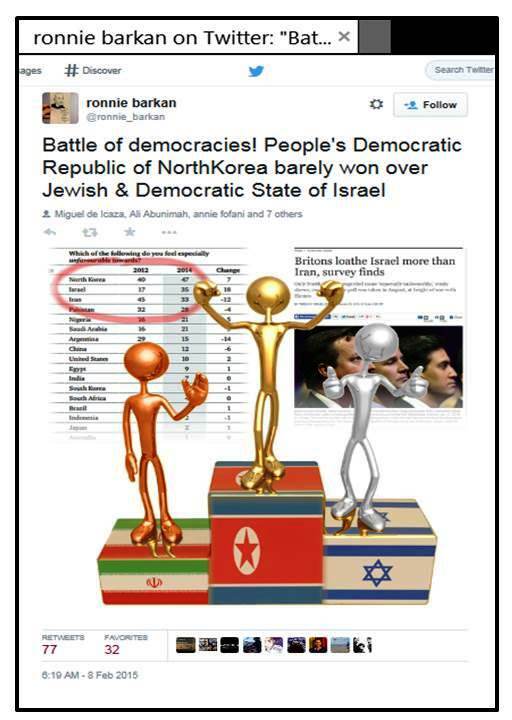 Apparently, Israel-haters all work from the same cherry-picked talking points and can’t be bothered to check them – because if they had checked the relevant table in the study, they would have realized that Russia was entitled to their “gold medal” as the country that was seen as “especially unfavorable” by a majority (56%) of the British public. But it would have been really awkward for Abunimah to crow about Russia’s propaganda efforts not paying off, since some of his best friends – like Max Blumenthal, for example, or Electronic Intifada contributor Rania Khalek – are popular guests on Putin’s well-financed mouthpiece RT. The channel has also featured various Holocaust deniers, conspiracy theorists, and neo-Nazis, and it reportedly provides a nice source of income for British politician George Galloway, who has been honored for his devotion to the Palestinian “cause” by Hamas leader Haniyeh and who supplements his salary as Member of Parliament with appearances on RT as well as Iranian and Lebanese TV. While there is no reason to downplay the truly dedicated efforts of Abunimah and his ilk to do their part in order to ensure that the world’s only Jewish state is among the world’s least favorably viewed countries, the negative image of Israel that is once again reflected in the Chatham House study has long been promoted by a wide array of opinion shapers. As the Simon Wiesenthal Center put it in reaction to a 2003 poll that showed a majority of Europeans viewing Israel as the foremost threat to world peace, this result indicated “that Europeans have bought into the vilification and demonization campaign directed against the State of Israel and her supporters by European leaders and media.” However, other polls show that this is not only a European problem. 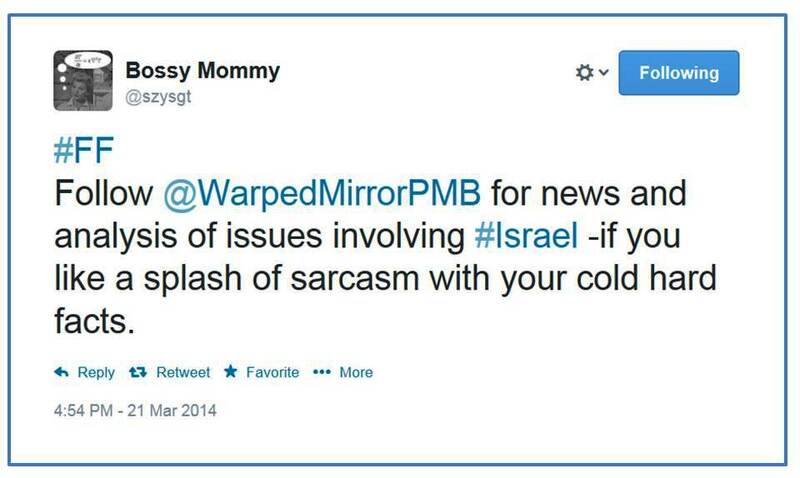 World-wide polls conducted by the BBC for 2012 and 2013 ranked Israel as a country seen to have a mainly negative influence along with North Korea, Pakistan and Iran. This is actually somewhat unfair to North Korea, Pakistan and Iran – at least if you form your world view on the basis of reports by Human Rights Watch (HRW). 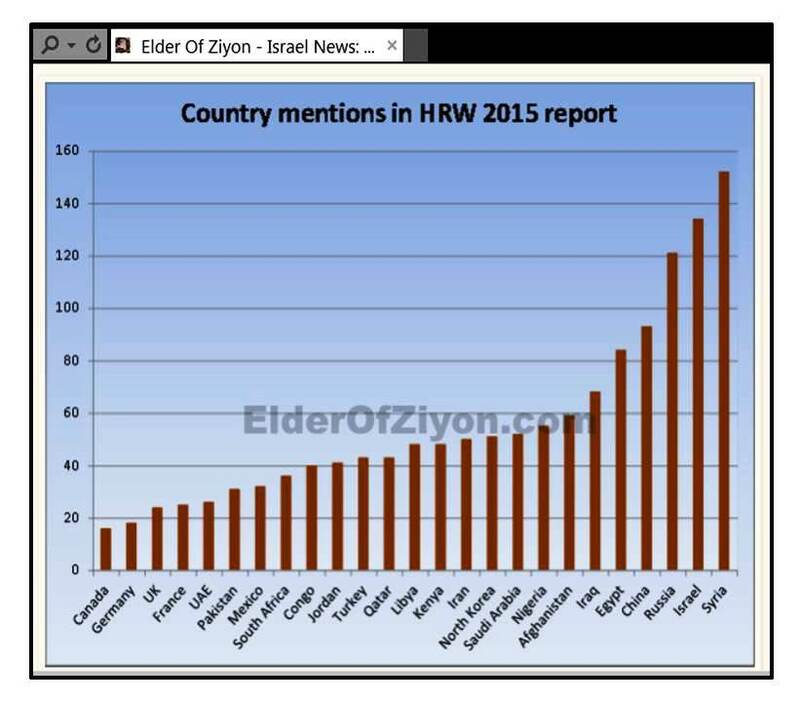 A recent post by blogger Elder of Ziyon provides a stark illustration of the pervasive demonization of Israel in a chart that tracks how often countries are mentioned in the new HRW 2015 “World Report.” According to this chart, only Syria – a country where in recent years not only hundreds of thousands have been killed, wounded or displaced, but where also more than 10 000 people have been systematically tortured to death – is mentioned more often than Israel. Millions nodded along when the Nazis asserted that “the Jews are our misfortune.” Millions nowadays nod along when the media and NGOs suggest that the Jewish state is the world’s misfortune. First published on my JPost blog 02/12/2015; also published on the Polish blog Listy z naszego sadu. “The propaganda in question is a stream of venom and denunciation directed toward the democracy that is Israel, and a similar stream of extenuation and denial about the terroristic activities of Hamas and affiliated jihadist groups, while also maintaining a deafening silence about the various Islamic and secular butchers from Iraq to Syria to Libya who have turned much of the Middle East into a slaughterhouse. From an American Interest article on “Pierre Omidyar, Glenn Greenwald, and Their War on Israel” by Gabriel Schoenfeld. Reading through Schoenfeld’s short summaries of some of Greenwald’s articles on the recent war between Hamas and Israel, I was struck by how much Greenwald’s writings seem to echo Ali Abunimah’s output at the Electronic Intifada. This is not to suggest that Greenwald copies Abunimah; he obviously just shares his hatred toward Israel and much of the ideology that is fashionable among Israel-haters. 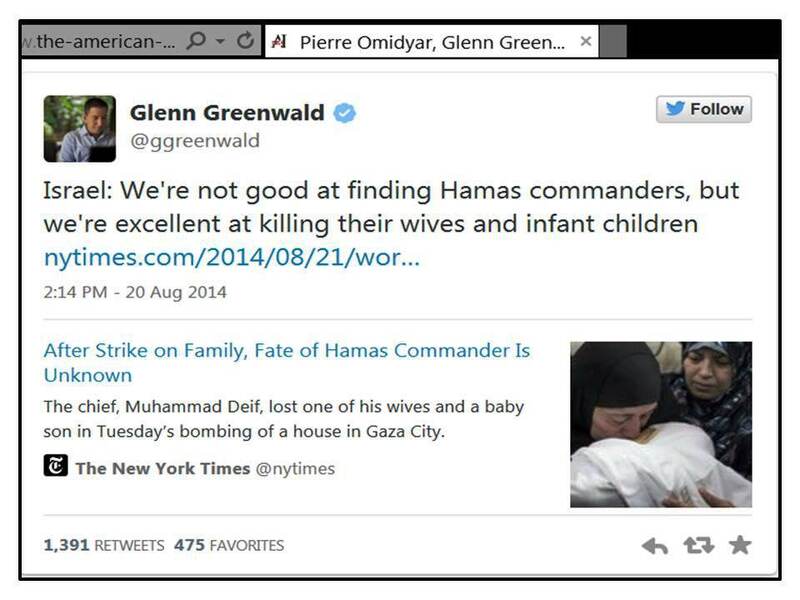 But while Israel-bashing is Abunimah’s main occupation, it’s only a side-show for Greenwald. However, it is noteworthy that when Greenwald takes to Twitter, his reach is clearly much broader than Abunimah’s: Greenwald has some 416 000 followers compared to Abunimah’s roughly 57 000 followers. In this context it is important that Schoenfeld highlights “Greenwald’s prolific Twitter output,” noting that in this medium “his hatred of the Jewish state takes its most pristine form” – an observation that could also be made for Abunimah. Among the tweets Schoenfeld reproduces to illustrate his point is the one copied below, which was retweeted by almost 1400 people. 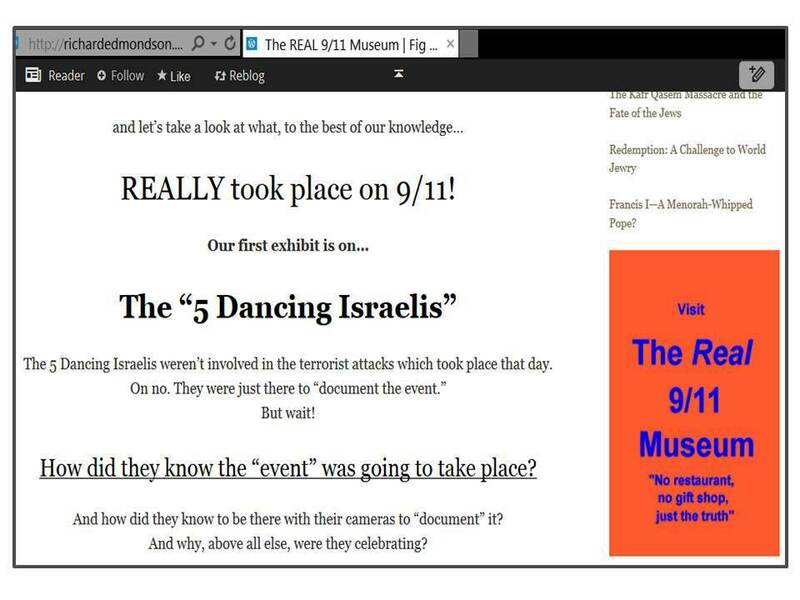 If so-called “pro-Palestinian” activists have the chutzpah to make this comparison, it’s only fair to recall that the Palestinians were among those who cheered and celebrated on 9/11. While there were later attempts to claim that this was not true and while the Palestinian Authority made every effort to suppress reports of Palestinian jubilation, the respected Pew Research Center monitored Muslim public opinion about Al Qaeda and bin Laden for a decade after 9/11, and the survey results document that throughout this decade, Palestinians remained bin Laden’s most ardent admirers. 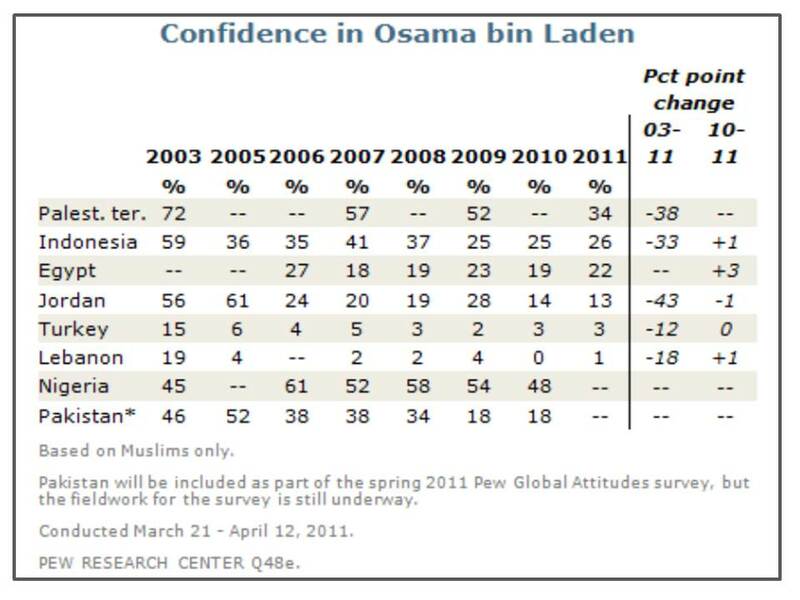 These results are all the more shocking in view of the fact that participants in the survey were asked if they had “confidence” in bin Laden “to do the right thing in world affairs.” Appallingly, in 2003, almost three out of every four Palestinians expressed “confidence” in bin Laden “to do the right thing in world affairs” and every third Palestinian would still feel this way shortly before bin Laden’s death in 2011. “57% of the public say that they supported the June 2014 kidnapping of the three Israelis in the West Bank when that incident took place. Support for the kidnapping reached 67% in the Gaza Strip and only 45% in the West Bank. 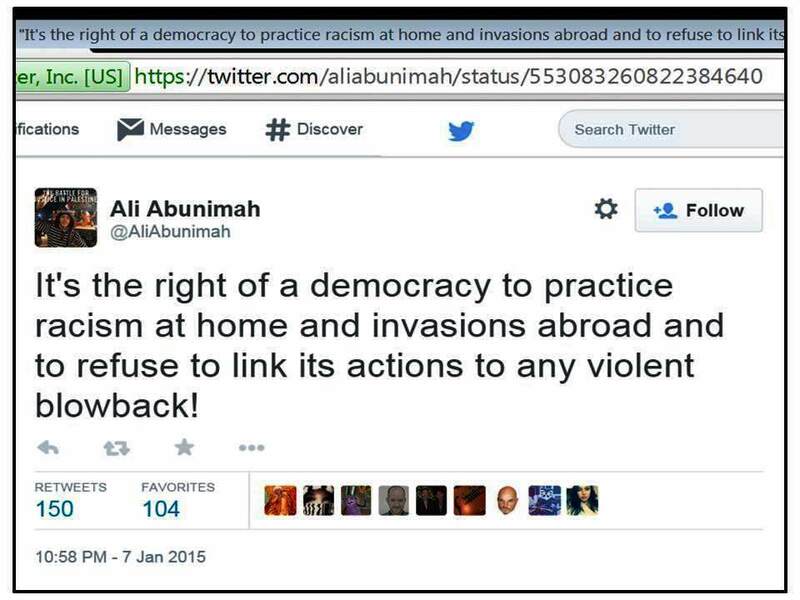 Unsurprisingly, anti-Israel activists like Abunimah push the same ludicrous notions. 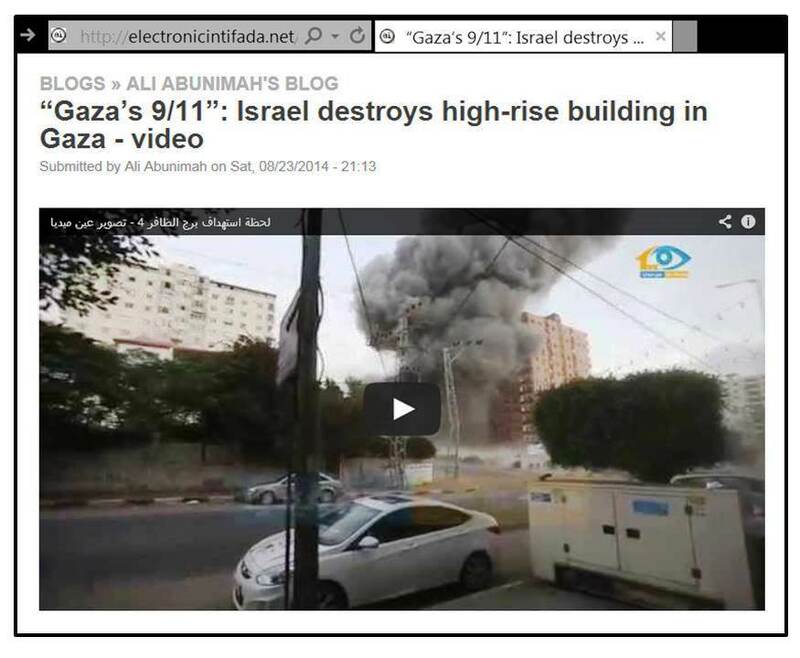 The “infographic” posted at Abunimah’s Electronic Intifada that suggests that New Yorkers fared incomparably better after 9/11 than Gazan’s after their many “9/11s” includes the complaint that “Palestinians are stuck in a repeating cycle, they cannot heal, nor can they accept the continuation of Israeli violence and blockade.” The statement that “Palestinians are stuck in a repeating cycle” is actually one of the few true pieces of information conveyed in this graphic, but as so many surveys show, this vicious cycle is entirely the Palestinians’ own making. When almost three quarters of a population have confidence that Osama bin Laden would “do the right thing in world affairs” and almost 80 percent believe a war that resulted in more than 2000 dead, more than 10 000 injured and considerable destruction was a “victory” for the terrorist organization that started it, there is unfortunately no basis for any constructive development.